When I first brought up the idea of making a gingerbread house and The Flying Crane pointed to a kit we could buy, I was very against the idea. Of course I was. No silly kit was going to tell me what dimensions my gingerbread house should be or what I have to use to decorate it. And why would I ever choose the easy way when I can get myself into these ridiculous situations and then write about them on my blog? But dang. Making gingerbread is hard. I don’t think I ever really helped with that part of the process as a kid and now I see why. There are so many steps and throughout the entire thing you keep thinking, well this is probably the hardest part. But it never is. Add in my lack of any baking skills whatsoever and there’s bound to be some funny moments. In a brilliant move on my part, all I had managed to accomplish in The Great Gingerbread House Debacle of 2011 before today was cut out the cardboard patterns. I should probably point out that I couldn’t find any house designs that I thought were big enough (I wonder why? Could it be that most people know they don’t want to make that much damn gingerbread? ), so I had designed my own plans without any real thought towards structural integrity. We were supposed to be putting together and decorating the house tonight, and though I knew this might be a stretch, I thought it was still fairly possible that we could get to that point. 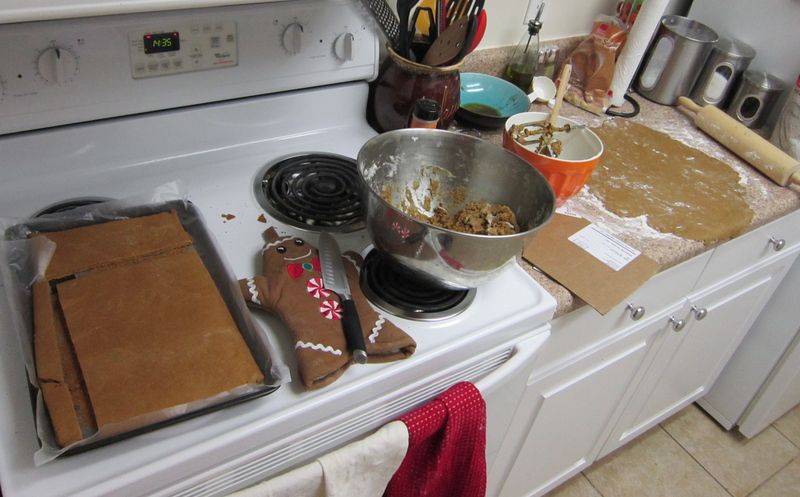 That hope died around Hour 3 of the gingerbread making process. I started mixing together the ingredients just after 6 p.m. and hit my first snag pretty quickly. It was a snag I had seen coming though, so I thought I could cope. While at the grocery store, I had bought self-rising flour. Apparently that was a no-no. It really should not be that complicated to buy flour, but between the ones that are bleached, the ones that are enriched, and the ones that are pre-sifted, I tend to have issues figuring out which one is the normal flour flour. I let The Flying Crane do almost all of the baking supply shopping and this is precisely why. Google told me I could compensate for the self-rising flour by just not using baking powder. But my recipe called for baking soda, not baking powder. I’ve always assumed they were pretty much the same thing, but I guess not. On a side note, has anyone else ever found it strange that baking powder and baking soda are both powder-like ingredients? Why isn’t baking soda a liquid? And what is the real difference between these two things that share half of a name and look exactly the same? Anyway, I decided to just use half of the baking soda that was called for, based on absolutely no reasoning or logic whatsoever. Then I began adding the flour. After The Flying Crane’s hand mixer began making strange keening noises with two cups down, seven to go, I knew I was in trouble. The next 30 minutes was an intense battle of Stubborn Woman & Cheap Hand Mixer vs. Thickest Half-Mixed Dough in Creation. We were victorious in the end, but I have the battle scars to bear witness to the struggle. This was about the point that The Flying Crane got home and I forbid her from entering the kitchen or even sitting in a chair with a view of it. It was important to my self-confidence that I could at least pretend she couldn’t tell I was doing it wrong. The next character-building moment came with the rolling of the dough. I have never been very good with a rolling pin, mostly because I become completely obsessed with trying to make a nice shape. Not only do I fail in that endeavor, I totally ignore the actual point of the rolling, which is to flatten the dough into one consistent thickness. I am happy to report that The Flying Crane (from the other room) and I managed to eventually overcome this particular obsession by rolling it into whatever abnormal shape it was yearning to be, then cutting away the extra to make a perfect rectangle. Pretty genius I know. Once the rolled-out dough had been baking for 30 minutes, I was supposed to take it out, cut it into the desired shapes using my cardboard patterns, then put it back in for another 30 or more minutes. After the first batch came out I realized the lady in the recipe was actually being serious when she said “It’s very important that the dough be rolled out into the same thickness throughout.” I took it more as a suggestion. Let me tell you, it is pretty difficult to cut burnt gingerbread into geometrical shapes. I became even more befuddled when all three of the patterns I had been planning on using to make something in addition to the house inexplicably disappeared off the face of the Earth. Most people would just abandon the side project, but no, I BROKE OUT THE MEASURING TAPE. The Flying Crane said good night and good luck around 11 p.m. but I hardly noticed because I was busy being my own one-woman gingerbread sheet assembly line. Things got pretty interesting when the dough starting drying out and cracking. The time when I didn’t notice the oven had turned off for half an hour made for extra fun as well. Then there was the moment when I dropped the baking sheet but managed to catch the already-cut gingerbread piece in midair. You just can’t be this clumsy without gaining some quick reflexes. Of course I didn’t catch the scraps, which went flying and broke into a thousand pieces all over the floor. I tried to pretend they didn’t exist until about two dozen became embedded in my socks and I finally had to break out the broom a little after midnight. This was the scene towards the end of Hour Two. As you can see, there was gingerbread that had been cut and needed to go back in the oven, gingerbread in the oven, gingerbread being rolled out, and plenty of gingerbread dough still in the bowl. Note that at this point no actual gingerbread had been completed. It’s currently 1:58 a.m. and I just took the last batch out of the oven. You would think bed would be the next step, but no. Now I get to wash dishes and try to find the kitchen counter tops under all this self-rising flour! If you’re wondering how I feel about gingerbread after all this, refer back to the photo above and particularly note the placement of the knife with the gingerbread man oven mitt. It was a subconscious move on my part, but it really captures my current mood towards all things gingerbread. Oh well, sometimes the only way to learn whether you should do something is by doing it. I would have always wondered if I would have liked it better to make the gingerbread myself. Now I know for sure. NEVER AGAIN. This entry was posted in Daily Photo, Ms. Adventures in a Klutzy Kitchen, True Story and tagged Christmas, Clumsy, Cooking, Daily Photo, Gingerbread House, Kitchen, Measuring Tape, Never Again, Reflexes, The Flying Crane. Bookmark the permalink. 7 Responses to Never. Again. Love this. 1:58 am and still crackin’? Amazing. If there’s one thing I always do, it’s stay committed to the wacky plans that get me into these situations. I just can’t resist! I can’t believe you even attempted it from scratch. THAT is amazing! Yeah I have no idea why I decide to do these things. But hey, the Leaning Parallelogram of Gingerbread is still standing. Even if it did take two tons of icing.